Merry Jane magazine posted Part 1 of a 3 part interview with Tommy Chong. Tommy was promoting his marijuana brand, Chong's Choice. Cheech Marin was in New York City last week promoting his new autobiography, Cheech Is Not My Real Name...But Don't Call Me Chong!. He did a book read at Barnes and Noble which was introduced by Geraldo Rivera. The Q&A session was hosted by SiriusXM's Jeffrey Gurian. This past week, Cheech and Chong, filmed an episode of the upcoming Netflix show, Disjointed. Disjointed is about a mom, Kathy Bates, who runs her own marijuana dispensary with the help of her three sons. CBS interviewed Cheech Marin about his new autobiography, Cheech Is Not My Real Name...But Don't Call Me Chong!, which will be released March 14th. Richard Cheech Marin's autobiography, Cheech Is Not My Real Name...But Don't Call Me Chong!, will be released March 14th. In it, Cheech says got tired of dealing with 'some f***ing Tommy s**t' from the 'world's humblest megalomaniac.' He goes on to say they were never best friends, they were like brothers. However, friendship and partnership imploded after Chong wanted to be the 'star director' and everything be 'his idea' He claims that after Up in Smoke, the offers started coming for Cheech, but not for Tommy. He says he turned down the offers because he didn't want to separate the act. Yet, this still agitated Tommy. We don't know if this is mentioned in the book, but a big part of the problem is Shelby Chong's dismay over Cheech's alleged marital issues. We also heard that allegedly Cheech and Tommy were going to sign a movie deal while Tommy was in prison, but Cheech would only sign if Shelby wasn't involved in the picture. They mostly got back together because of money. Cheech had two divorces and Chong had his legal bills. 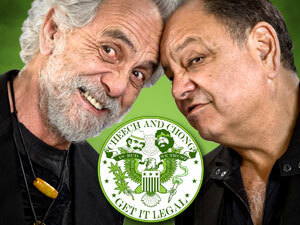 Chong had this site repeatedly send emails to Cheech encouraging him to reunite.